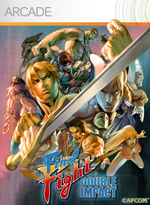 Available beginning April 15 on Xbox Live® and PlayStation® Network, Final Fight™: Double Impact takes you on a hard-hitting journey through Capcom history with the ultimate versions of arcade classics Final Fight™ and Magic Sword. Double Impact slams into your home with seamless online and local co-op gameplay, new music by acclaimed remixologists, HD-filtered graphics, a host of unlockables to discover, and an integrated online leaderboard to prove your mettle! Online Multiplayer - Relive these classics with friends, both new and old. GGPO network technology creates a frame-accurate arcade experience across the internet, and with online voice chat and the ability to join games in progress, it's just like playing in the arcade. Thanks to a toggle-able open invite system, other fighters can jump right in and donate their fist or sword to the cause. Remixed Music - Soundtrack adapted by the highly-acclaimed composers responsible for Bionic Commando: Rearmed. Or if originals are your thing, hit the switch and take a blast down audio past. High Quality Visual Enhancement - Final Fight™ and Magic Sword have never looked so good! By utilizing our proprietary graphic algorithm, both games now shine in crisp and clear HD glory. For the purist pixel junkies, toggle it back to play through in its classic original format. There.s even the option to play the games within an arcade cabinet on your TV screen! Leaderboards - Bring your A-game, as Final Fight™ and Magic Sword tracks your scores to compete for bragging rights around the world. ©CAPCOM U.S.A., INC. 2010, ©CAPCOM CO., LTD. 2010 ALL RIGHTS RESERVED. "PlayStation" and the "PS" Family logo are registered trademarks of Sony Computer Entertainment Inc. The PlayStation Network Logo is a service mark of Sony Computer Entertainment Inc. Microsoft, Xbox, Xbox 360, Xbox LIVE, and the Xbox logos are trademarks of the Microsoft group of companies and are used under license from Microsoft. The ESRB rating icons are registered trademarks of the Entertainment Software Association.